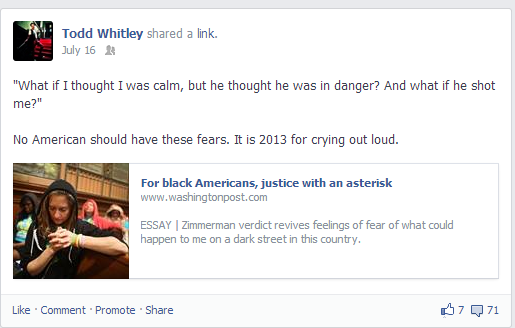 on July 16, while on vacation, i posted a link on my Facebook to an essay written by Robert Samuels (@newsbysamuels) who wrote about fears he has as a young black man, in our society today, in the wake of the Trayvon Martin verdict. 71 comments later, i was stunned and angry. i was so upset, i had to close my computer and force myself to calm down. all of the comments in my post about a cultural issue—not the verdict!–were from people i care about and most of them were highly argumentative in response to what i posted. it’s worth noting, mirroring national polls, all the dissenting comments were from white people but several of the comments in agreement were also. i could not believe it. in fact, i still cannot. in response to this conversation, all you–and i use this word in the collective sense–could do was argue. you pointed out that it’s the media and posted videos to support your point. you argued that the jury made the right verdict based on what they were told. you argued your relatives didn’t own slaves and that it wasn’t your fault. later, you even posted a video on my wall of a (or perhaps the one) prominent black athlete who agreed with the verdict. (remember, my post wasn’t about the verdict.) and overwhelmingly, you argued that racism is not the issue that many, particularly non-whites, believe that it is. you have the right to believe what you believe. i believe it is my responsibility to ask you to listen. to look outside white privilege and try to empathize. to try and understand the historical and cultural impact of the greater conversation: that racism is still alive and well in America. not to argue that i am right and you are wrong. but to ask you to soften your heart and listen to a voice different from the ones you may have heard before. sunday, i heard another message, preached within a series designed to commemorate the 50th anniversary of the March on Washington, that moved me, and immediately, i wrote the outline to this post, biding my time until the video was posted so i could share it with you. this particular video from my church, Cathedral of Hope, will take about 20 minutes. that’s all i ask. through this video and reflection, i hope you will listen and soften your heart so that you can hear what the dead, what the murdered, what those with different colored skin than we have are saying to us.